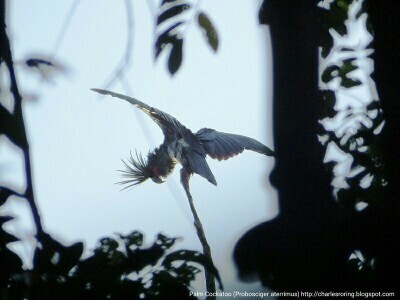 Here is the photograph of Palm Cockatoo (Probosciger aterrimus) that I made in Waigeo island of Raja Ampat. This big bird was eating catappa fruits when I shot it from a wooden bridge above the sea. Palm Cockatoo is relatively a big bird compared to other birds such as kingfishers or hooded butcherbird. Its black feather looks contrast if we compare it with its red cheeks. Although the bird is not considered as endangered species, the bird is being hunted and sold in big cities as pets. Palm Cockatoo is a big tropical bird with red patches on both of its cheeks. This bird has got big beak that it uses to eat fruits such as the ones from catappa and nutmeg trees. Its original habitat is New Guinea, Aru islands and even in northern Australia. In Indonesia, we call it Kakatua Raja meaning King Cockatoo. Visitors who want to go birding in West Papua can watch the bird in Mesirrokow lowland forest of Manokwari, in Tambrauw Mountains and in Waigeo island of Raja Ampat. Although the population of this bird is high, in certain regions where huge areas of rainforest have been converted into palm oil plantation and logging concession, the bird cannot be seen anymore. 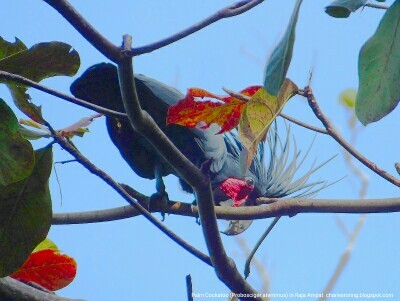 I made the second photograph of Black Palm Cockatoo when I was taking guiding some German tourists in Klasow valley of Sorong regency of West Papua. Actually I and the other visitors were waiting for the Twelve-wired Bird of Paradise to perform on its display tree. The bird that we were waiting for did not come. In fact, it was a Palm Cockatoo that came to the trunk. He was sitting there for quite long perhaps trying to dry his black feather under the bright sunshine. I made a lot of pictures of the birds. When it was expanding its wings, I shot him using my bridge camera Fujifilm HS50EXR. He was on the top of a tree that was quite far from me. Because I was against the light when trying to take pictures of the bird, I had to brighten them using Android based PhotoDirector application in my Samsung Tab A tablet.